Not since “Star Wars” has the film industry been energized by a trilogy like it has been for “The Lord of the Rings”. The first part, “The Fellowship of the Ring”, was released to glowing reviews and record-breaking box office in December, 2001 and parts Two and Three continued to break records in the same manner. First editions of the original books as well as contemporary merchandise related to the film are hot items on the secondary market. 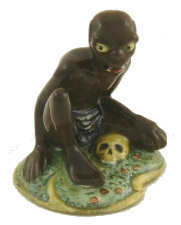 Pictured right: Royal Doulton Figure Gollum HN2913. At the turn of the Millennium, “The Lord of the Rings” was chosen by thousands of readers as the best book ever written. It’s author, John Ronald Reuel Tolkien, was born in South Africa in 1892. His family moved to England in 1895 and he never returned to his homeland. Tolkien pursued an academic life when he reached adulthood. He loved language and mythology, specializing in linguistics. During WWI, he served with the Lancashire Fusiliers in France, but was sent home with trench fever in 1915. During his convalescence, he began to write poems and short stories about his life in the trenches, living underground in holes and huts. When he was discharged in 1918, Tolkien was employed as a lexicographer, helping to compile what would become the first edition of the “Oxford English Dictionary”. Then in 1925, he became a professor of Anglo-Saxon at Oxford University. He remained with the university until his retirement in 1959. During the early 1930’s, he began to work on his first success, a children’s book entitled “The Hobbit”, which was published in 1937. It sold well, and his publisher asked for another book about Hobbits. Pictured left: Sideshow Collectibles Bilbo Baggins. Tolkien started writing “The Lord of the Rings” around that time, and, after delays necessitated by the Second World War, it was completed 12 years later. Then it languished for several years as various publishers rejected the project as being too lengthy and too risky. Finally, in 1954, “The Fellowship of the Ring” and “The Two Towers” were published, followed by “The Return of the King”a year later. The trilogy was a phenomenal success. In spite of his newfound fame, Tolkien continued his modest life in academia and retirement until his death in 1973. Pictured right:: Fossil Watch featuring the Witch King on the dial and is packaged in a resin mould of the Witch King’s head. Not unlike the original publisher of the books, New Line Cinema has taken an enormous risk by financing the production of all three films in one stroke. At a total cost of $300 million – a financial hole that may sink the company if the project fails – it’s not surprising that there is an army of ancillary products to bolster the bottom line. There are action figures from ToyBiz; busts from Sideshow; toys from Burger King; posters, trading cards, ceramic mugs, ornaments – even a special edition DVD player. Check out the New Line Cinema online store for all the latest offerings. If you’re a “Lord of the Rings” fan, there’s a bonanza of collectibles out there. NOTICE – This site is not affiliated with New Line Cinema. The purpose of these pages is to provide information to collectors of “Lord of the Rings” paraphenalia.